Fill the test vial with 5 ml of water. Add 6 drops of the pH reagent and swirl gently for 10 seconds. Compare colors by looking through the side. For this purpose, hold the white part of the color chart against one side of the test vial and look through the opposite side. Best results are obtained by using natural daylight. If the color is somewhere between two values, then the pH is also in between those values. 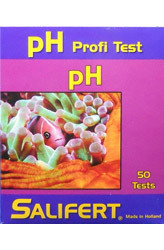 If the pH is too low, the alkalinity might be too low. However, never increase the alkalinity to a value higher than 12 dKH or 4.3 meq./L.